繼 搶救 HTPC 之 WINDOWS/SYSTEM32/CONFIG/SYSTEM 找不到 之後, 今天 htpc 又開不進去了. 看來跟上次的症頭一樣, 還好有作紀錄, 就照著上次的步驟再作一次, 半個鐘頭左右就處理完了. 幾個月前發現家裡的 AP 壞了, 開起來燈號會亮, 但是完全掃不到無線信號. 不過在家很少用無線網路, 所以是先跟朋友借一台來用. 前兩天去光華商場時, 終於順手買了一台 AP. 我買的是華碩的 WL-520gc, 買來就刷成 dd-wrt. 關於怎麼刷, 網路上很多文章, 搜尋一下就知道了. 不過我第一次用到這種有很多網路 port, 以前的和這次借的都只有一個網路孔, 網路線插下去就對了. WL-520gc 有分 WAN 和 LAN, 對 internet 連線只會從 WAN 出去, 而 web 的管理界面則要從 LAN 連過去, 所以變成同一個 hub 要連兩條網路到 AP 上. 不過如果不使用管理界面的話, 其實 LAN 這條線路線可以拔掉. dd-wrt 的 web 管理界面看起來功能很強大, 很多功能看不懂是在設什麼, 大概要去研究它的文件, 才能搞懂它在作什麼吧. 目前看到一個很讚的功能, 是可以看到目前即時的流量圖. 一個 open source 的 firmware, 功能比原本的還要強, 實在是太厲害了. 大概今年四五月左右, 老婆在環球購物中心裡買了一個珍藏版龍博士魔術金字塔 (簡稱金字塔). 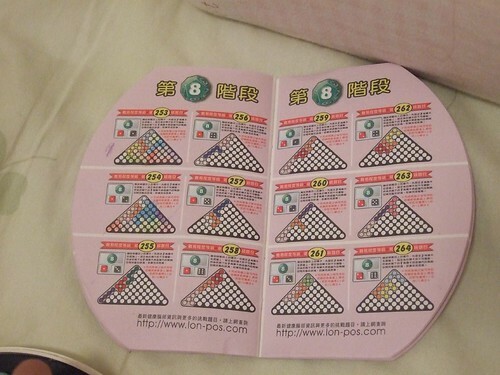 它有十二塊不同顏色和形狀的積木, 擺進一個 10x10 的平面三角形區域裡. 遊戲盒的外殼上, 另外有可以疊成立體金字塔的區域. I found Symantec Endpoint Protection was installed on my nb by MIS someday. I was fine with that since I had no control what software the company decided to install on company's latptop. Today, it really pissed my off!!! I brought my laptop back home since 1/1 was a long vacation. I turned it on, connected to intranet via VPN, doing some stuff, then left it turned on for hours. When I was back to my laptop, I found the network connection was reconnected, and the VPN is broken. Since the VPN was broken, I was exposed under public connection. All of us knows that the internet is not a safe place sice there are many people keep scanning hosts for exploits. Then I found Endpoint kept pop messages up. The Endpoint insisted to display them all, and I had no way to turn it off!!! That's REALLY ANNOYING!!! The message told me that someone was trying to send a malicious packet to my laptop, and that attempt was blocked by Endpoint. So what? There's nothing I can do about it. Endpoint caught that, good, and can you just stop annoy me? During the write of this blog (that's about ten minues), the Endpoint message still kept popping up. I was already back to VPN since then. Why does Symantec think a user really care about every instance about scan attempt?